My first time at Crowders and I loved it. Great fun and great views and a great price. I had low expectations for course conditions because of the price and the lack of amenities, but the key was that the bent grass greens were in good shape. A few collars had issues but the greens themselves rolled well and didn't have any issues - save one. Apparently a vandal took a 3-wheeler to the 17th green creating some nasty tire track damage. However, the green was big enough to put the pin away from the damage. Fairways were cut high so they were slow -- which helped on a few holes with sidehill slopes. The tee boxes were not manicured at all either -- a few were even cut in random spots that didn't look like a tee box (#6 and #11). That was kinda what I expected for the price and the rural location. Those course condition gripes aside, this was a ton of fun to play. It plays much shorter than the yardage on the card and many of the greens are flat and easy to read. The elevation changes provide much of the challenge. 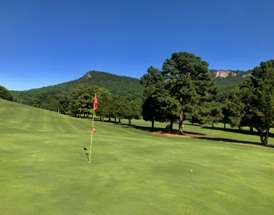 Almost every hole offers views of the namesake mountain. It's a very picturesque layout. My first meeting with "Young's Revenge" - the fabled "hardest par 5 in the world" - resulted in a double bogey, even though I was only about 15 yards off the green in 3. It is predictably overhyped, but does require 3 really good shots to get to the green. I look forward to getting my revenge the next time I play it. Take note that there is no driving range and the clubhouse doesn't sell beer. So bring your own cooler. I will be back again soon.